A project to provide low-cost spaces for biolab start-ups has been launched in Shepherd’s Bush, London. The Open Cell scheme provides 20 studio laboratories in shipping containers, in which entrepreneurs can build, test, and demonstrate biotech-focused innovations. 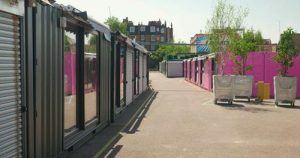 The project is located in the Old Laundry Yard in Shepherd’s Bush Market, with assistance from London Borough of Hammersmith and Fulham and SynbiCite. Synbicite is an ‘innovation and knowledge centre’ for synthetic biology at Imperial College. Co-founder Helene Steiner explains that the idea is to help “talented students with incredible ideas but nowhere to develop them. “There is little or no infrastructure available to early-stage biotech businesses to take their concepts to the next stage”. Project funders and advisors Professors Paul Freemont and Richard Kitney, co-directors of SynbiCite, added: “We are seeing new companies popping up in unlikely places, outside the traditional university environment. “We hope Open Cell enables early stage innovators to propel their ideas to prototypes faster than before. “We are particularly excited about the opportunities for collaboration between designers, artists and biotechnologists that will make Open Cell and the UK the leading place for innovation in bio-based applications”. Old Laundry Yard launched earlier in 2018 and is home to a number of food and drink businesses.